I’m a fan of Paul Berry & Co’s new curation platform RebelMouse (I’m also a small investor). Many content companies have adopted the service as their “social front page,” including TIME, TechCrunch, the USA Network and many more. 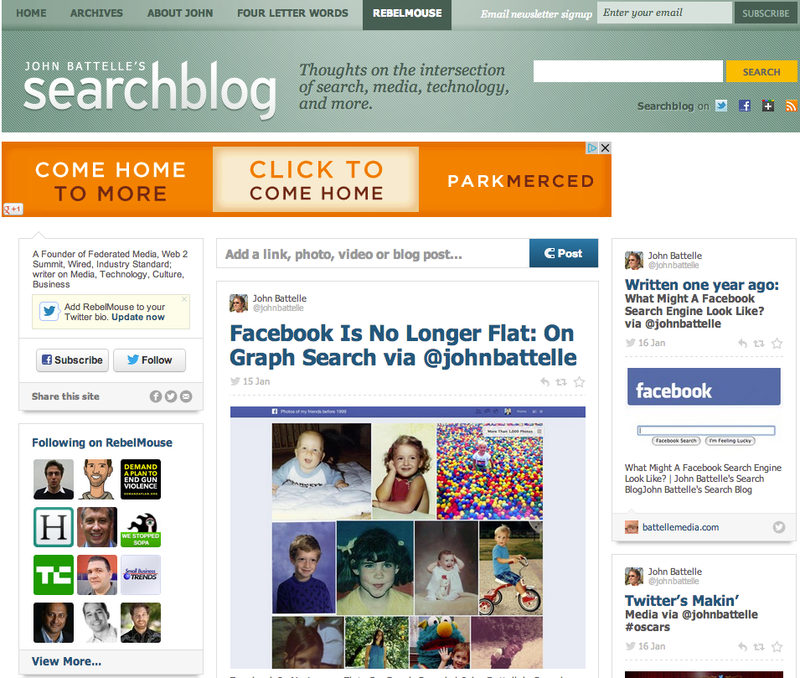 Now thanks to the folks at RebelMouse (and my wizards at Blend), Searchblog has a similar page. You can see it here, I’ve also added it to the navigation bar at the top. RebelMouse organizes the things you tweet, post to Facebook, etc. into a clear, coherent presentation, and give each person the tools to arrange them however they want. It’s pretty cool. Check it out! Oh, come on, John. Is this picture supposed to be clear and concise? Just looking at it makes my eyes squirm. There are 9 (at first count) seperate things going on here at the same time. Your average user will just run away.